5-finger latex gloves with chemical roughened surface for extra grip. Rolled edge. 33 cm length. Supplied with 5-finger cotton inner gloves. 5-finger latex gloves with chemical roughened surface for extra grip. Tapered cuff which will seal against a latex wrist seal. Length approx 33 cm. 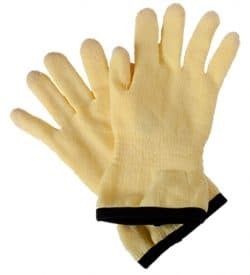 Supplied with 5-finger cotton inner gloves.